9+ Russian PDF Lessons for Beginners. Free Downloads. Want a nice collection of Russian PDF Lessons? You got it. No need to sign up here. No need to give me your email address. Here, you’ll find all KINDS of lessons on grammar, vocab, phrases, numbers and more. PDFs are awesome because they’re like eBooks. Save them to your phone/device and read on the go. Download by clicking on the image or blue text. Want FREE Russian Audio/Video Lessons? Click here. 1. 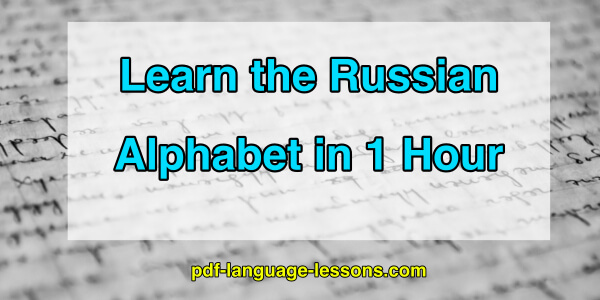 Learn the Russian Alphabet in 1 Hour. This quick guide teaches you all the letters of the Russian alphabet. And yes, if you follow it, you can learn them all in just an hour. This Russian PDF Lesson is all about learning the letters. Not reading. Not writing. Just memorizing the letters. Want to start speaking Russian? If so, then the best place to start is with yourself. With this PDF lesson, you’ll learn how to talk about yourself and all the must-know phrases. 3. RussianPod101 PDF Cheat Sheets. 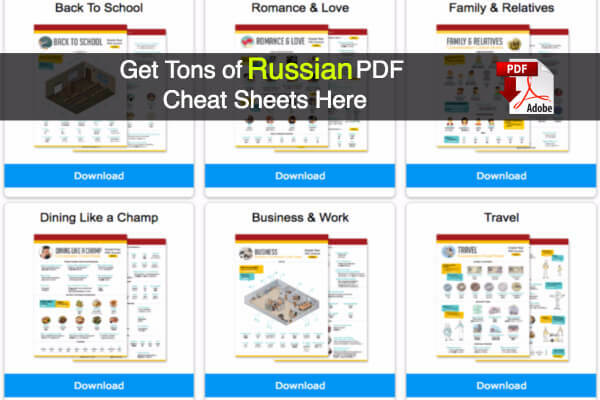 Here, you get RussianPod101’s collection of PDF cheat sheets and learning guides. Each one is about 1 to 2 pages long. These cheat sheets cover various topics such as romance, talking to family, business travel, food and much more. One of the best ways to learn Russian words, phrases and overall things to say is through… conversations. And with this Russian PDF Lesson, you get a whole bunch of conversations to mimic and learn from. First, you learn Russian question words. Then, you learn the most common questions that you’ll hear AND How to answer them. Grammar is tricky. You need things explained. You’ll likely use other resources to get MORE explanations. So, with this Russian PDF Lesson, you get just a few of the basics. Once you know them, move on to something else. 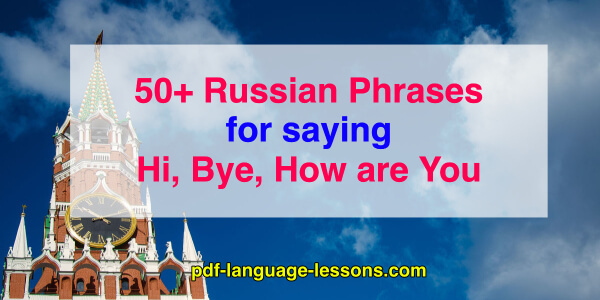 In this BIG Russian PDF Lesson, you’ll learn the many ways of saying hi, bye, and “How are you” in Russian. Yes, you’ll need these for Russian conversations. Yes, you can learn them in 5 minutes with this PDF. That is, if you can follow the special rules taught inside. 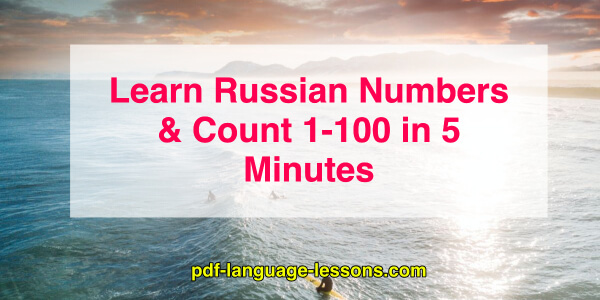 If you’re a beginner and can’t yet count, this Russian PDF Lesson is for you. This Russian PDF Lesson is simple. 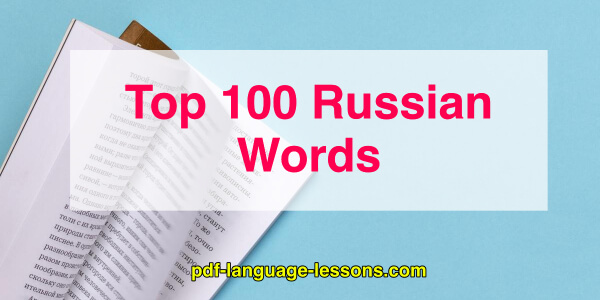 You just get a list of 100 Russian words and their meanings. That’s it. How should you use it? Just save it or print it and review it ever now and then. Don’t try to memorize. Just quickly glance through. More Russian PDF Lessons coming soon. Like these? Want to see something else? Or need something explained? Leave a comment below! I read them all and will be adding more and more with time. P.S. Want to learn and speak Russian? 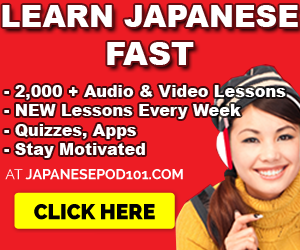 Check out RussianPod101, a complete Russian learning program with audio and video lessons, apps, study tools and PDF lesson notes. 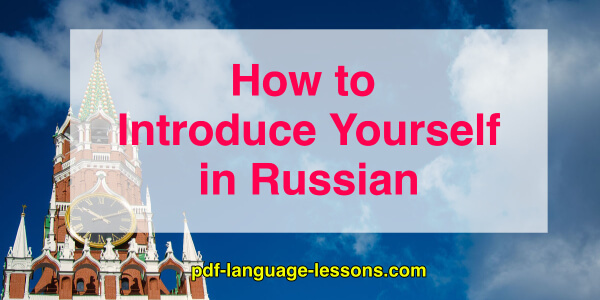 I think their lessons can and will help you learn and speak Russian to a certain level. This entry was posted in Russian by admin. Bookmark the permalink.